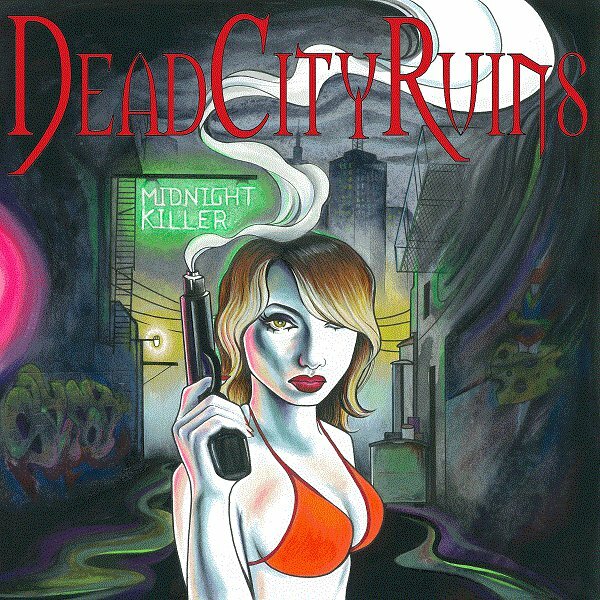 Despite the first two tracks indicating it as such, to call Dead City Ruins’ debut full-length Midnight Killer a sleaze metal album would be to do the band a dis-service, as it is far more diverse than that. The Melbourne quartet (now a five piece) take a great deal of influence from across the metal and rock n’ roll board, releasing a fun, catchy and heavy album. Lets get something straight, though – there isn’t anything particularly glammy about this band. Sure, there may be influences from that particular genre throughout, but these guys are a dirty, honest bunch of rock n’ rollers. This album is free of pretence, and chock full of excess – just the way it should be. What hits home the most about the album for me is it’s sheer bottom end. The bass playing leaps between relentless, doomy fuzz to clean accompaniments, and at times the band seems to have more in common with Witchfinder General’s faster moments than Motley Crue. Other moments on the album, such as “My Lai Massacre” wouldn’t sound out of place on a Dio album, with each member showing off their chops – from heavy bass fuzz, to killer metallic leads and soaring vocals. Oh, and the lyrics kick-arse, too. For much of the album, however, it isn’t so cut and dry as to what genre each song falls into. The band have achieved a cross-section of influences on many of the tracks, with bluesy rock n’ roll riffs shoulder-to-shoulder with speed metal sections. Not content to follow the traditional formula, DCR bring the tempo down, free of cliche, with the aptly titled “Blues”. This track is heavy and eerie, with singer Jake Wiffen whispering his way into an evil, downright creepy dude. Like every song on this album, the band takes the listener through highs and lows, with the song turning on its head two or three times before it is over. Definitely the stand out track on the album. Everything on the album are elements you will have heard before, but mixed together in quite this way – not so much. The band definitely summons the ghosts of music’s past, but putting enough of their own spin on these influences to dodge the pit of becoming a throw-back band. This is true, straight-up rock n’ metal. What’s not to love? This entry was posted on February 17, 2012 at 4:41 pm and is filed under Records. You can follow any responses to this entry through the RSS 2.0 feed. You can leave a response, or trackback from your own site. I was lucky enough to see these guys 3 times in the UK last year. They give one of the best life shows I’ve seen to date, from the cracking musicianship to the eardrum-blasting vocals. He can even perform standing on the bar having pints ordered between his legs. Can’t recommend them enough. Have a copy of this album. And it gets played. Lots.